The American Dental Association and most dentists will tell you that the best things you can do for your smile are daily brushing and flossing and regular preventive dentistry appointments. Luckily, the majority of Americans still have access to good preventive dental care. For the people of Greece, economic decline, cut funding for healthcare, and an increase in consumption of cheap, sugary foods has lead to negative impacts on oral health. This beautiful oasis for tourists may be facing generations of struggles with their smiles. A recent investigative report revealed that, in Greece, public funding for health care has decreased 9% a year since 2009. These drastic cuts in funding leave an ever increasing number of Greeks without access to necessary preventive dental services. Additionally, the country’s economic woes mean people have less disposable income to seek preventive dentistry services using their own funds. That means many people choose to neglect oral health until they have serious, expensive issues. A large percentage of Greeks are unemployed or underemployed, and they have started consuming larger amounts of sugary, processed foods. This diet is detrimental to oral and overall health. Not only does it reduce the number of necessary nutrients to build and maintain healthy teeth and gums, but these foods also drastically increase the risk for tooth decay and gum disease. Most processed foods are high in sugar. This means, as they’re broken down by oral bacteria, the acidity of the plaque is increased, weakening enamel, irritating soft tissue, and leading to serious oral health concerns. Kids have been especially hard hit by this oral health crisis. A study indicated that 86.8% of Greek five-year-olds had untreated oral health issues. 60% of oral health issues in 15-year-olds were left unmet for at least a year. Without the necessary preventive and restorative dental care for children and young adults, these kids’ oral health struggles forecast a continued increase in poor oral health in Greece’s coming years. Brooklyn dentist, Dr. Frank Sapienza, has spent more than thirty years helping patients learn to love visiting the dentist. 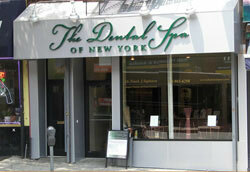 His Brooklyn dentistry practice is named The Dental Spa of New York for a reason! You’ll be treated to a relaxing, comfortable dental care experience that will exceed the highest patient expectations, and we’ve seen even the most anxious dental patients start looking forward to their office visits. If you want to learn more about the latest in the dental field, come back to our blog regularly, or give our friendly dentistry team a call.